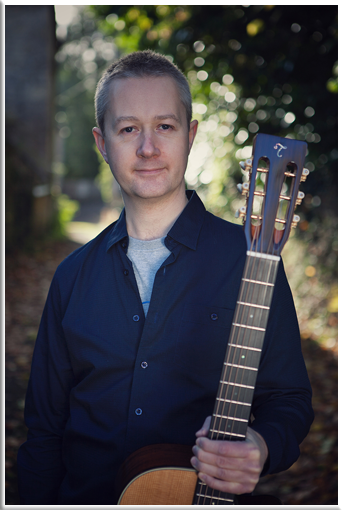 As a composer Stuart’s fingerstyle guitar work has appeared on TV shows around the world, most prominently on several programmes for the UK’s Channel 4. He writes tutorial columns for Guitar Techniques and Guitarist Acoustic magazines each month and was a featured contributor to both the Rockschool and London College of Music guitar exam syllabuses. Stuart has released two albums of solo guitar music and three books of fingerstyle guitar arrangements: ‘The Tradition’, ‘The Heritage’ and ‘Acoustic Legends‘ – with The Heritage being described as ‘Essential’ by Guitarist magazine. In addition to composing and recording he tours as a clinician for Takamine Guitars and has shared the stage with modern guitar greats Jon Gomm, Thomas Leeb, Martin Taylor MBE and many others. A versatile and experienced guitarist he is available for live performances or electric/acoustic guitar recording on your project from his home studio just outside Bath, UK. Please get in touch via the ‘Contact‘ page to discuss your needs.